Yesterday was really crazy weather wise! Early in the day it was quite cold and windy. Thinking the cold was in the wind blowing across the snow in the nearby mountains. While I was at knitting, it was still blowing and snowing some. Not sticking tho - thank you, God. Then later it warmed up and the sun was shining. 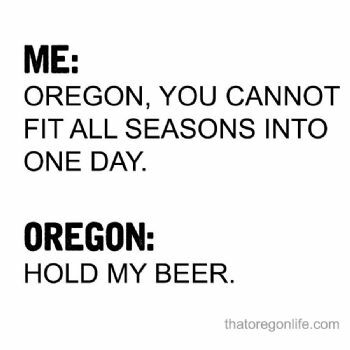 Well, that's Oregon for you!! If you don't like the weather, just wait a few minutes. here chilly in the 40's and then warms up to 80 or 90! So glad the snow didn't stick. Enjoy the sunshine ! !